The Chapel Hill sign welcomes visitors approaching the gates of the vast, beautiful, historic Shenandoah Valley farm. The Randall Linebacks, America’s oldest and rarest cattle breed, graze the fields of Chapel Hill Farm, which dates back to the late 18th century. Nestled in the Shenandoah Valley, Chapel Hill Farm, is a registered Virginia State and National Historic Landmark. The farm is dedicated to conservation, with hundreds of acres set aside for wildlife rehabilitation in order to restore indigenous grasses, insects, birdlife, and animals to the Virginia countryside. The Randall Linebacks live much as they would have centuries ago, slowly grazing on pastureland and drinking fresh water from our underground limestone spring. 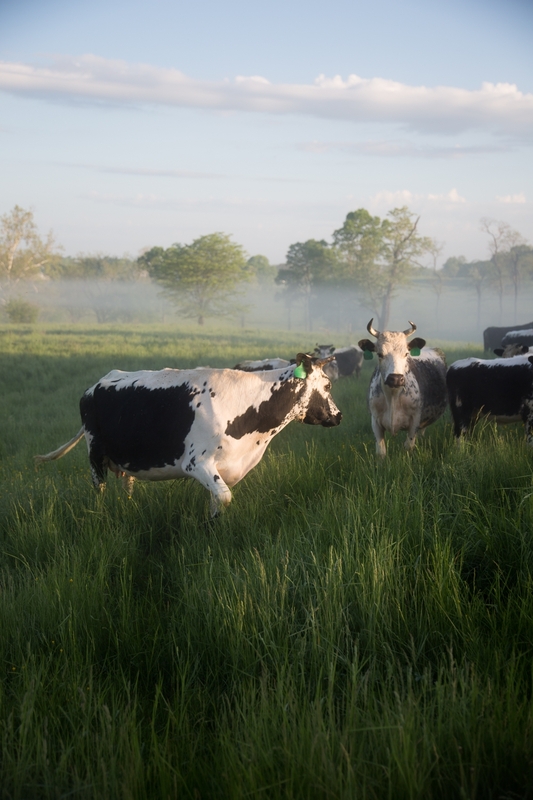 "We find poetry in raising historic, heritage cattle on an historic site, turning back the clock to a time when animals ate well, drank deeply, and roamed freely—when raising cows was an artisanal undertaking, rather than industrial practice." Chapel Hill Farm Randall Linebacks: where history meets an artisanal approach to farming. Developed hundreds of years before factory farming, concentrated feedlots, and highly-marbleized, standardized beef cattle, the Randall Lineback has survived unchanged since the 1700s. The combination of exceptional genetics, historic land, and traditional farming practices creates an absolutely unique product: Chapel Hill Farm Randall Lineback. Our farm team is small but wholly dedicated to the care and stewardship of the Randall Lineback, the world’s rarest cattle. Much as their grandfathers and great-grandfathers once did, our team works outside in all kinds of weather to ensure the highest quality of life for these special animals. Each member of this skilled group has years of training and experience to draw on. They have also worked together for over a decade, overseeing the recovery of the Randall Linebacks. Our farmers are our miracle workers.